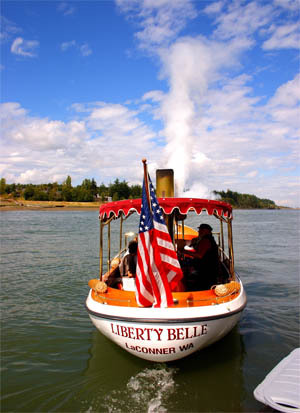 The Liberty Belle is the only Steam Launch west of Boston that holds a United States Coast Guard Certificate of Inspection to carry eighteen passengers! Departing hourly (except Tuesdays and rainy days) from 11 a.m. to 5 p.m., from the Dock at the Pier 7 Building, LaConner, Washington. Tickets are available at Whiskers Cafe at Pier 7 or at the dock.